What is it that I’m studying “the making of…”? For a long time, the preliminary title of my research project was communities in the making… I was thinking of Britain and France as the two communities that were in a constant state of creation and recreation. Then I realised how flawed this title was. First of all, many misunderstood what I meant by “community”, thinking that I had such an old-fashioned perspective on society as consisting of different (“ethnic” or whatever) “communities” that were reproducing themselves. (Perhaps I lost a PhD scholarship that way). Second, I finally realised that it wasn’t strange that people misunderstood, as “community” is the very word particularly favoured in multicultural thinking of ethnic minorities. The word then seemed to be useless for my usage in general, and particularly useless, as I wanted to employ it on the situation in France. There, the word seemed most commonly used in relation to communautarisme; the community-making of religious or “ethnic” minorities which threatens the societal cohesion of society as a whole. “Society” seemed thus a better choice. Home Migration and the City: New Narratives, New Methodologies – here I come! What can people learn from your research? And what did I answer to the question yesterday? First, I though eh… something about social classification blah blah…? 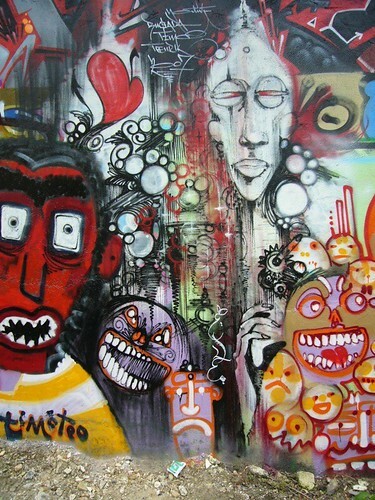 That they are different in different societies…? That social cohesion and nationalism is different in different societies…? No, these things people say all the time. 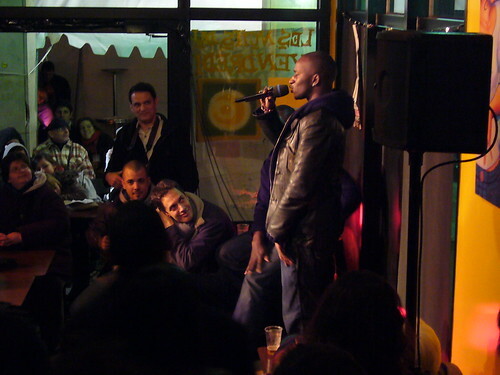 What I really want try to convey is perhaps the greatest thing about the Parisian slam poetry: How little it takes to create an inclusive environment where even a newbie like me can feel at home, and where one get to know others and get to express oneself. Can I write a manual to an open, cosmopolitan democracy in practice!? Ethnographic documentation? Art? Anyway: It’s spring! 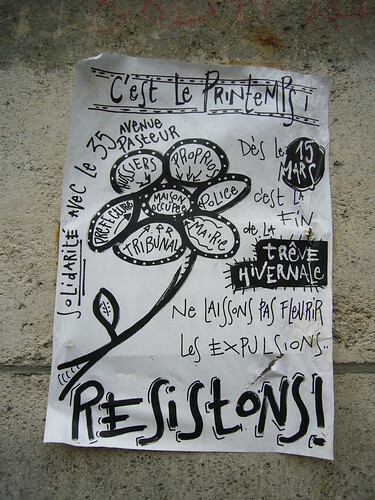 Let not the expulsions blossom - Resist! When I started blogging again, I gave myself a 10-days interval between blog posts. The interval should be long enough to be realistic and feel comfortable, but not so long that I lose sight of the trains of thought I keep on track here. To blog regularly, sharpens the attention (as I said a long time ago here) to the little tidbits that pop up in the mind which somehow connect to the research process, without being speaking directly to what I’m working on. There are a couple of blog posts at various stages along the production line, but as I discovered today that I’m three days late for my self-imposed 10 days deadline, I’ll skip the mindfulness and instead just quickly sum up one thing I’ve been working on lately. At the same time as I read Knausgård and pondered upon anthropological elements in novels, Aleksandra Bartoszko interviewed me (in Norwegian) about some photos I’d taken during my fieldwork in Paris. Inspired by an art exhibition (see the interviews with the artists Lange and Heier), she made a series of interviews on ethnography and art and asked me about how I saw the differences between the two. I’d never thought of my photos neither as ethnography nor as art, and she made me think about the criteria I – until then, unconsciously – confer on the one and the other. The co-occurrence of the interview and my plunge into fiction inspired me to initiate a workshop on Representations of social life (Norw.) at the Norwegian Anthropological Association’s annual meeting, which Aleksandra and I will co-chair. It was hard picking a photo for this post. 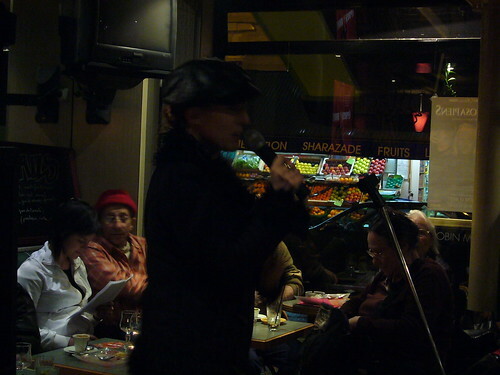 So many of my photos evoke memories from my many slam nights in Paris, but how to find a photo that can convey some of theses feelings to the readers of this blog… With this one, I hope to put across the mundaneness of French slam (the greengrocer’s Sharazade in the background), as well as some of it’s diversity of participants. My thesis takes shape from the margins, and slowly, slowly am I circling in the core chapters. I don’t think this is a particularly good way of composing the general argument of the work, but I have a fairly good idea of why the core content just keep slipping away from me. The final part of this core, the chapter where I give an in depth analysis of the slam sessions, is finally now on its way. Thus on a deeper level, it feels like I’ve always had an idea of what goes on. But to actually describe what happens, is far harder. The first part of what I call the core, is thus just very hard to get a grip on. Anthropology is just one way among many fields that try to make sense of and represent social life. A post ago I stated that it probably isn’t even the most superior at it. Funnily, in the days after I wrote that post, I read in the papers several similar comments made by other social scientists. “The best novelists and playwrights are – almost by definition – those who understand human nature better than others” (the social and political theorist Jon Elster quoted by the ditto theorist Rune Slagstad in Morgenbladet 19-25, 2010. Jon Elster is interested in the role emotions play in relations to knowledge and behaviour. And no social scientist gets as deep into these intricacies as authors. Why is that? How do novelists do that? Does it have anything to say that the versimilitude (truthlikeness) of their depiction of the world within and around us resonate with the reader’s experience, rather than hinge on the logics of scientific methodology? Or is it a function of the literary language compared to concise concepts?